Although our church dates back to the 14th century, you will find that we are proud to live and worship with our hearts and minds firmly in the 21st century. Open 7 days a week, you are always welcome! 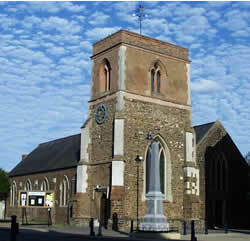 Our parish church is very easy to find - if you have a satnav, simply enter our post code, SG17 5DD. If not, don't despair - we enjoy a prominent position right at the heart of the vibrant and picturesque market town of Shefford in Bedfordshire - click here to view and print our maps. Part of the United Benefice of Meppershall & Shefford, we aim to offer you the widest possible range of opportunities for worship, friendship, spiritual development, healing and growth, family friendly activities, and social/cultural events to suit all ages and tastes. Whether you're new to the area and looking for somewhere to put down your spiritual roots, visiting Shefford, or you just think "there's got to be more to life than this", come and spend some time with us and see what being part of a truly open Christian community can add to your life. Whatever you choose, we'll do our very best to make you feel welcome!